This is a simple class that can be used to retrieve the listing of e-mail addresses of a cPanel hosting account. 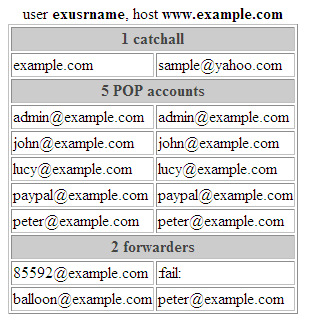 It accesses to a cPanel Web server on behalf of an administrator user, and retrieves the pages that list each types of e-mail address: POP accounts, forwarding accounts, and catch-all accounts. The pages are parsed to retrieve the specified type of addresses, which are returned in an array.